Roll out the pie shell onto the assembled baking sheet (this reduces the damage that might occur when transferring from the counter to the baking sheet). Place tomatoes in the center of the pie shell leaving approximately 2 inches of the pie shell free. Sprinkle mozzarella pieces over the tomatoes. Sprinkle salt and pepper over the tomatoes and mozzarella. Fold up the edges of the pie shell up and over the tomatoes and mozzarella. Whisk together the egg and water and brush this mixture over the pie shell. Sprinkle salt over the pie shell. Place in the oven for 30-35 minutes of until the pie crust is golden brown, the cheese is bubbly and the tomatoes look ready to burst. 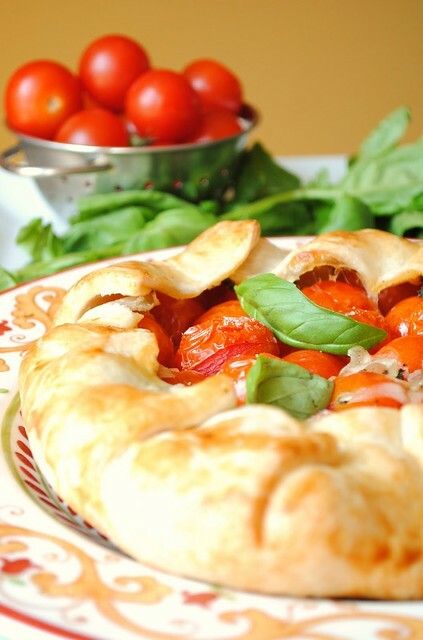 Garnish the rustic tart with fresh basil leaves and serve warm.